This TV movie, made for the BBC in 2013 as part of the 50th anniversary celebrations for Doctor Who, is about that show’s origins and the people both aboard the Tardis and behind the scenes who made it what it was. For nerdy, long-term fans like me, it’s a delight. After the opening announcement above, the story begins with a police box sitting by the side of a country road at night. A car drives up and stops. The old man inside (David Bradley, playing William Hartnell, the first Doctora) sits quietly for so long that a policeman emerges from the box to tap on the car’s window, ask if he’s all right, and to tell him he’ll have to move on. Cut to Mr. Hartnell in his dressing room at the BBC, smoking fretfully and telling the stagehand who knocks on his door to “sod off”. He doesn’t want to go out. 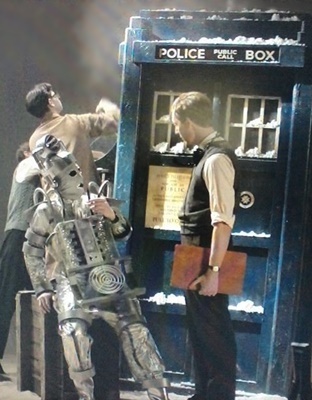 In the studio, an original-style Cyberman hangs around beside the Tardis, also smoking while the stage crew throw fake snow over everything. They’re waiting to start shooting the scene, whenever their star is ready. People who are up on their Dr. Who trivia will realize that the Cybermen made their first appearance in “The Tenth Planet,” William Hartnell’s final episode as the Doctor before he retired from the show. Which explains why he doesn’t want to come out and finish up his last day on a job he’s loved. 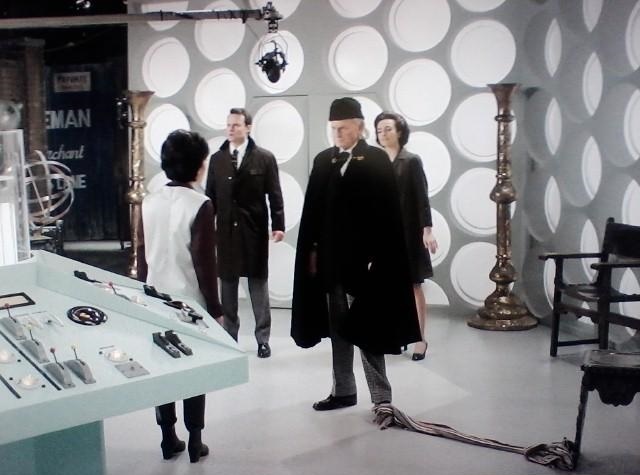 When he does finally emerge, costumed and ready to do his scene on the interior Tardis set, the Tardis starts up and the camera zooms in close on the “Year-Ometer,” showing us that it’s 1966. The numbers flip backwards–65… 64… until it’s 1963. This isn’t one of my favorite episodes; I usually skip over it on the DVD. But I’ll bet that Chris Carter, creator of The X-Files, likes it more than I do. He’s always attributed the inspiration for his own show to his teenaged watching of the Kolchak series, and you can certainly see some inspiring points in this particular episode. I knew this would be more than the biggest story of my career. It was the biggest story in the lives of everyone on this planet. I fought for the story, fought harder than ever before. As usual, Carl’s story of bizarre happenings in the Chicago area begins with a murder–not a woman or a man this time, but a cheetah at the Lincoln Park Zoo. The big cat is attacked by some unseen menace in its cage one night (and I wonder what they were really doing to the poor thing to make it look so agitated). When his editor Tony Vincenzo tells Carl about the cheetah being “missing” the next morning, he says that this is old news. He’s confused it with a “missing” panther from the day before. When Tony corrects him, Carl recalls that a panda died at the same zoo last week, and this pattern interests him enough to pursue the story. I recently mentioned this as one of my favorite movies. Since I wrote a brief review of it a long time ago, I thought this would be a good time to drag that out, revise and extend it a bit, and repost it. I love Horror Express more than is reasonable. It stars Christopher Lee and Peter Cushing, but it’s not a Hammer film. Hell, it isn’t even Amicus or Tigon. It was produced by a Spanish studio with a little help from Granada TV, and filmed in Spain; beyond Cushing, Lee, and Telly Savalas, there are few actors in the cast whose first language is English. The whole thing was filmed without audio, and the actors’ voices dubbed in afterwards. Fortunately, the three stars have dubbed their own voices–it would be too weird if they sounded like someone else. The story begins in China in 1906. Professor Saxton (Lee) is leading an expedition for the Royal Geological Society, when he discovers an apeman frozen in ice—he calls it a “fossil” even though there’s plenty of flesh left on those very old bones. He intends to cart this important find back to England on a trans-Siberian express train. 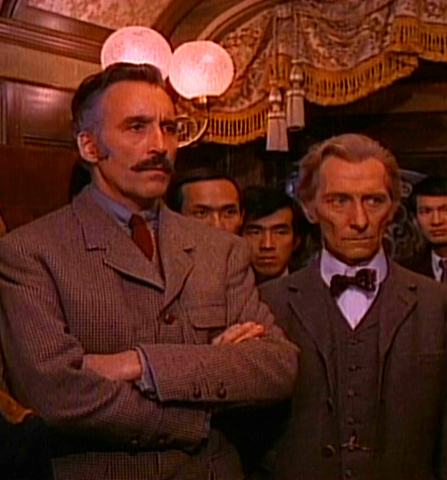 A rival scientist, Dr. Wells (Cushing) happens to be at the Shanghai train station at the same time (according to the signs around the station and dialog, it’s Shanghai; the caption at the beginning of the scene says it’s Peking). When Wells learns that Saxton’s discovered something remarkable, he’s eager to get a peek at it, but Saxton has the crate securely fastened shut with big chains and a padlock. The big, padlocked crate draws attention from other people as well. A thief tries to pick the lock to see if there’s anything worth stealing inside, but he winds up lying dead on the station platform with his eyes glazed and white, as if he were blind. After this incident, a Rasputiny monk declares the contents of the box evil; he demonstrates it by failing to draw a cross on it. Saxton sneeringly dismisses this as a trick using some kind of special chalk or hypnosis. I think that the monk just didn’t press down hard enough. The Colour out of Space is closer to science fiction than horror than most of H.P. 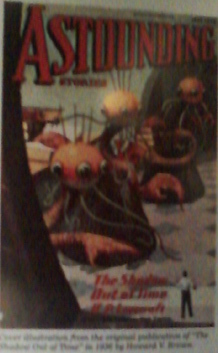 Lovecraft’s work, although it certainly has its horrifying aspects. This 1927 short story considers what lies out there in the vastness of space, unknown and incomprehensible to humanity; like the narrator, one may feel “an odd timidity about the deep skyey voids above” by the end of it. The story begins with a meteorite that crashes on the Massachusetts farm of Nahum Gardner in 1882. Scientists from nearby Miskatonic University come out to examine it, and discover an object too soft to be metal but possessed of peculiar properties. Not that they have much time for testing. The meteorite shrinks rapidly and, after several lightning strikes during a storm, disappears completely. Yet something remains behind. That autumn’s crops grow extravagantly large and glossy, tinted with an indefinable color that reminds everyone of the fragile globule found inside the meteorite–but all the fruit is inedible. The next year, the plants grow stunted and brittle. Tree branches seem to move even when there’s no wind. Wild animals near the farm behave strangely and appear to be subtly deformed. The livestock that isn’t able to flee becomes ill and starts to shrivel, turning grey and brittle like the plants. The whole farmyard glows faintly at night. And although the water from the well is obviously contaminated, the Gardner family continues to drink it. At first glance, this could be an early story about the effects of exposure to radiation; this being Lovecraft, however, there’s more going on than a mere environmental hazard. An active and conscious entity has taken up residence in the farm well and is draining the life out of everything organic in the vicinity. The text is online at http://www.dagonbytes.com/thelibrary/lovecraft/thecolouroutofspace.htm. In 1908, a Miskatonic University political economics professor named Nathaniel Peaslee collapsed while giving a lecture to his class. When he regained consciousness, he had no memory of who he was, was badly coordinated, wore an odd expression, and spoke in a stilted, archaic style as if English were an unfamiliar language. His wife and children, convinced that this wasn’t Nathaniel at all, were horrified and had nothing further to do with him. In his new personality, Peaslee pursued a very different sort of life, absorbing knowledge on a variety of subjects from the abstruse to the childishly simple. He made mysterious trips all over the world–Arabian deserts, the Himalayas, the Arctic–and contacted several occult leaders during his travels. Then, in 1913, he built a small, strange machine in his Arkham home. An anonymous phone call requested that a doctor come to tend to him; when the doctor arrived, Peaslee was unconscious and woke slowly, speaking words from the lecture he’d been giving in 1908. The original personality had returned, with no memory of what he’d been doing for the last 5 years. This second film follows the first as a tribute to the scifi movies of late 1950s and early ’60s, but it adds on a jungle adventure. The production values have also taken a couple of steps up with the addition of a new production manager, Tony Tremblay. While his props retain a certain goofy period charm, they don’t have the same found-objects look as the props in the first film. Another noteworthy change is apparent in writer/director Larry Blamire’s wonderfully inane dialog, which has becomes more polished, and his characters’ names. In the original Lost Skeleton film, the “Earth names” the aliens picked out for themselves–Bamen and Turgasso–seemed more than a little weird. In this movie, they would fit right in. Peter soon receives an answer to this mystery, when the Skull begins to speak to him in that familiar, arrogant and obnoxious voice. Its skeletal body was destroyed at the end of the last movie, which somewhat limits its ability to act for itself, but it still has its mind-control powers and soon has Peter doing its bidding. The Skull announces that to restore its body, it will need to be exposed to “an idol called the Dalp of Anacrab” in an unexplored region of the Amazon basin named Menalusa (aka, the Valley of the Monsters). The next thing you know, Peter tells his wife that he has to go to South America on TV-repairmen business and packs a suitcase. Reet Pappin calls at the home of well-known Rock Scientist Dr. Paul Armstrong and is greeted by Paul’s lovely wife Betty (Fay Masterson, wearing the same dress from the previous movie, but now with longer and darker hair). She invites Reet in for coffee and cookies and tells him that she hasn’t seen her husband since he left for the Amazon jungle 2 years ago; he sent a telegram when he arrived, and that was it. She doesn’t seem very worried–she is, after all, a scientist’s wife and used to this kind of thing–but when Reet says he’s going to South America to look for Paul, she insists on going with him. They fly to South America, as shown on the map. At a warehouse belonging to Draile Import Export, Handscombe Draile himself meets with a cheap hood named Carl Traeger (Kevin Quinn). After very slooowly checking Carl’s identification, Draile tells him that he’s sending an expedition to the Amazon to find the source of Jerranium 90, and Carl is to join it. Peter flies to South America with the Skull. Carl also flies to South America. Different flights, same passengers boarding. After I reviewed Trail of the Screaming Forehead a few weeks ago and spoke highly of the other films of Larry Blamire, I started rewatching them all and decided to say something more about them. The Lost Skeleton first. 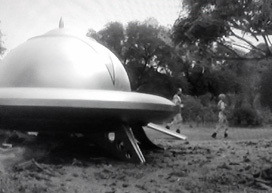 This film was made in 2001 as a parody and tribute to the low-budget, black-and-white scifi films of the 1950s. I always think that parodies work best when the people creating them are knowledgeable about their subject, have an affection for it, and most important of all, understand the appeal of it. We have a good example here. The Lost Skeleton is extremely goofy with its mash-up of several B-movie plots and use of low-budget props. With it’s Ed Wood-style wooden dialog, it’s also frequently and hilariously stupid. These are its charms. Watching it, I feel certain that Larry Blamire has seen even more of these type movies than I have, and he loves them. Our story begins with a typical-looking 1950s couple driving a (1961) Thunderbird through the countryside. 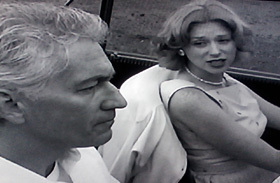 They are Dr. Paul Armstrong (Blamire), a Man of Science, and his lovely wife Betty (Fay Masterson), heading for a cabin they’ve rented in the woods. Betty is hoping that Paul will take a break from doing Science for a romantic weekend, but Paul’s main reason for this trip is to find a meteor that landed in the area. He believes the meteor is made of atmospherium, a radioactive element that could mean actual advances in the field of Science. When I was watching the first episode of Nigel Kneale’s second Quatermass series for the BBC, I had the feeling I’d seen something like it before although the rest of the story didn’t progress the way I thought it would. What I remembered involved an indestructible blob monster coming up out of the ground. This was the movie I was thinking of. It does look like a sequel to Hammer’s version of The Quatermass Experiment–but it’s not. It’s more a sort of Quatermass wannabe. Hammer originally intended it to be another tale in the continuing adventures of Professor Bernard Quatermass until Kneale objected to their unauthorized use of his character. The studio went ahead with their story idea, but with certain names and other details changed. Up in the rocky Scottish Highlands, a group of soldiers is conducting an exercise using a Geiger counter to scan for and locate a harmlessly small amount of radioactive material buried out on the heath. The sergeant (Michael Ripper, not playing the same sergeant he was in Quatermass and the Pit) is about to call it a day, when a young man named Lansing chirps up that he hasn’t had a turn. The other soldiers moan and groan, but the sergeant goes out to rebury the little canister so Lansing can find it. Lansing takes awhile and the company’s lieutenant goes out to join him to see what the problem is. The Geiger counter is picking up a very strong signal, much higher levels of radiation than the canister contents would emit. The ground beneath their feet begins to tremble and a long crack opens up in the earth. The rest of the men retreat to safety, but when the crack widens into great fissure, poor Lansing and one other man are caught in the blast that shoots up out of it. Trail of the screaming forehead. First, a few words about the films of Larry Blamire. I discovered The Lost Skeleton of Cadavra when I purchased the DVD second-hand a few years after its 2001 release and thought it was clever and cute. The film was made on a pocket-change budget in the style of the even more low-budget sci-fi films of the 1950s and early ’60s which it lovingly parodies. Much of it was filmed in Bronson Canyon and features that same cave in which Ro-Man made his lair in Robot Monster, the giant space-brain Gor hid in Brain from Planet Arous, and Roger Corman used in a half-dozen other movies of the era. What impressed me most was Blamire’s talent as a writer for mimicking the stilted, overblown, and frequently inane dialog of such movies. You have only to watch The Lost Skeleton in conjunction with Plan 9 from Outer Space to appreciate it. The Lost Skeleton was eventually followed by a jungle-adventure sequel, The Lost Skeleton Returns Again and Dark and Stormy Night, the latter of which has become one of my favorite films; it started me off on a search for the Old Dark House movies it parodies and eventually led to my addiction to Dark Shadows. At the end of The Lost Skeleton is the promise of the next film, Trail of the Screaming Forehead; in the DVD commentary, Blamire assured the viewer that this wasn’t a joke, but a real movie he planned to make. So here we are at last! At the end of Part 5, Captain John Dillon, missing since the second episode, returned under the aliens’ influence. 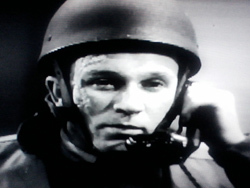 He and a group of zombified soldiers have taken over Quatermass’s rocket base to stop the rocket from being launched. Quatermass wants his daughter to leave the Rocket Group offices right away, but Paula refuses to go and abandon him. They’re too late in any case, since Dillon comes up from the base just then. He shows them his written orders to take over–“from the very top,” which shows how high the alien influence has reached up into the British government at this point. Leo notes that these orders were issued before the explosion at the plant and tells John to send the soldiers with him away. And John does. Quatermass and Paula try to reach the man they knew before the aliens got to him. Quatermass brandishes a fragment of that first meteorite at Captain Dillon, reminding him of how this all began only four days ago. He explains what happened to Dillon… and what will happen to the rest of humanity if the ammonia-breathing aliens succeed in taking over their world: submission first, then suffocation as Earth’s atmosphere becomes more noxious to accommodate the invaders. As he appeals to Dillon to find whatever’s left of the individual human being, the scene recalls the lost ending of the original BBS version of The Quatermass Experiment, in which the professor talked to the monster Victor Carroon had become and brought him back to his humanity. It does seem as if John Dillon struggles with his identity as Paula and her father plead with him, but it isn’t until Leo Pugh tells him bluntly “The rocket must go” that Dillon is really influenced. After a moment of confusion, he agrees to speak to his men down at the base and tell them there’s been “A change in plans. Withdraw all troops. Stand down.” However, he hasn’t shrugged off the aliens’ control over him. Astute viewers may have noticed that Leo’s been a bit odd since Quatermass found him sitting outside the destroyed factory, but Quatermass himself won’t notice for awhile.